Join this small group tour exploring the highlights of Japan and immerse yourself in the rich history and vibrant colours of the Land of the Rising Sun. experiencing some of the country’s most spectacular festivals. Discover the unique colours of Japan in spring or autumn, on this tour that visits Tokyo and takes you to the beautiful, relatively unexplored north of Honshu island. Day 1: UK-Tokyo. Fly overnight to Tokyo. Day 2-4: Tokyo. Discover Tokyo on included excursions. Day 5: Tokyo-Mount Fuji. 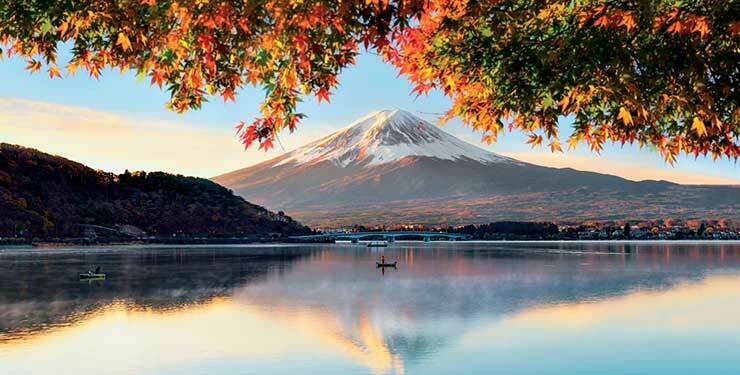 Visit Mount Fuji and ascend to the 5th station for stunning views. Day 6: Tokyo-Hiraizumi-Morioka. Catch the bullet train to the north of Honshu Island. Day 7: Morioka-Lake Tazawa-Kakunodate-Akita. Travel to scenic Lake Tazawa and admire the seasonal beauty. Day 9: Aomori-Hakkoda-Hachinohe-Tokyo. Travel to Mount Hakkoda, renowned for its autumnal beauty. Ascend via the Hakkoda Ropeway cable car. Day 10: Tokyo-Kyoto. Catch a bullet train to Kyoto, Japan's cultural heart. Day 11: Kyoto. At leisure. 1) All prices are £s per person based on two people sharing, flights from Heathrow to Tokyo returning from Osaka with the scheduled services of Cathay Pacific. 2) Offer for Saga Possibilities members only. 3) Offer applies to new bookings only. 4) Offer cannot be combined with any other offer. 7) A reduction of £71 applies if you do not need the optional travel insurance and additional cancellation rights. 8) Total holiday duration includes 11 nights in hotels and 2 in flight. 10) VIP door-to-door travel service - Includes a return chauffeur service from your home to your local airport for an included domestic flight to your main departure airport, standard class rail travel from your local station to your departure airport, or complimentary parking at the airport if you'd prefer to drive yourself. 12) Saga reserves the right to amend or withdraw any offers without prior notice.